Successfully Added Football Mini China Cell Phone (Quad Band, Dual SIM) to your Shopping Cart. Talk football, breathe football, and live football with this powerful Mini China Cell Phone. Those passionate about the sport will love the unique Football themed mobile phone while others will love the full range of features, including Quad Band GSM, Dual SIM card slots, media rich feature set, and much more. With the 2010 FIFA World Cup approaching fast, now is the time to get your favorite football-themed gadgets and toys. What better way to start it off than with this beautiful Mini China Cell Phone, which comes in a compact Football Shape and includes a unique football-themed UI (complete with music and ringtones) that all fans will fall in love in - no matter what team or player they're rooting for! Fully Unlocked - Use with any carrier, network, and SIM card(s) of your choice. Quad Band Connectivity - Works on all four main GSM frequency bands (850/900/1800/1900 MHz) for usage and great reception world wide. Call your friend in South Africa to tell them you're coming, then when you get there, call your friend back home to let them know you arrived! FM Radio - Even if you can't make it to the match, you can still join in on the action by tuning in to your local FM radio stations for live broadcasts! Bluetooth - Share files/pictures of your favorite strikers or goalies through an easy Bluetooth connection to other mobile devices, as well as being able to use hands-free communications through a Bluetooth earpiece. Camera and Video Recorder - Capture exciting moments of the game with high quality pictures and video! Java - To keep you occupied with your favorite Java programs and games during time outs! 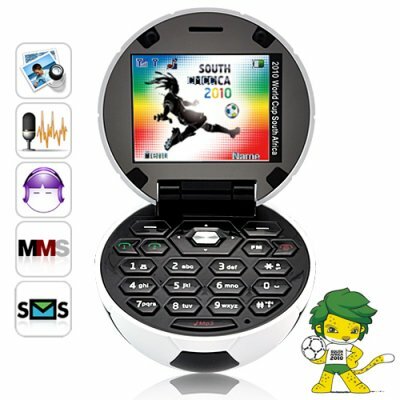 This unique Mini China Cell Phone comes in a Football Shape to make it the ideal gift and promotional item for the FIFA 2010 World Cup. It's arriving just on time, so be sure to grab a few now, then a few more after the World Cup as a souvenir. Better still, if you order today, we'll express ship it out to you tomorrow! Brought to you by the leader in Wholesale Electronics and Tech Gadgets - Mini Chinavasion. Can I get this amazing Football Mini China Cell Phone after the World Cup ends? Of course! It'll make a great souvenir for after the World Cup ends! Can I request to have my favorite player/team's name imprinted on the phone? If you plan on ordering over 200 units, you can contact our CS team. For those who don't mind a little DIY (do it yourself) effort, you can turn your Football Phone into whatever you want! Will there be a Tennis Ball Mini China Cell Phone for the Wimbledons? There are no plans as of yet, but for customers to want plan on making large bulk orders (300+), contact our CS team. If you plan to resell this item on international auction sites, the most common category names for this product are - fútbol teléfono celular, téléphone cellulaire de football, telefone celular de futebol, calcio cellulare, nogomet mobitel, телефон футбол ячейки, Ποδόσφαιρο κινητό τηλέφωνο, fotbal mobilní telefon, sepak bola ponsel, futbol cep telefonu, telefon nożnej. Despite small size, it's speaker is very loud and clear - sound quality is outstanding. Also there were many functions which really surprised me, like built in blacklist, ambient sound option etc. Really neat, easy to use phone. A true must have for a fan! My girlfriend loves it soo much. I could not believe this little Gem, Its so small and cute. All functions are excellent and with all the accessories including 2 batteries its a must for any footy fan, dont get me wrong it wont fit in your pocket but I used the small lanyard to attach it to my trousers and when it rings I simply press the 2 little catches and the lanyard releases the phone and its opened and your talking. If you have a bro like me who is fitba mad this pressy is for your! And when I get finished showing it off to all in the work he will get his pressy ( Honest, He Will. I Swear it, He will. Well maybe Christmas then? ) Anyway this little 4n must be seen to be believed, its superb. Oh and if you have a son who loves footy, I recon they will nominate you for Best Da ever if you get them this ( Especially since no one else in the country will have one, Except my brother. Look I will give him it......... One Day. So get off my back Okay ) But back to the phone, when I took it out of the box I was astonished by the size and after about 10 minutes ( when I finally found out how to open it ) I put my sim card and its battery in and played with it for another few minutes ( Ok about 25 to 30 ) and my old LG Renoir hasn't seen my Sim card since and every time I get a call or text I laugh at this little Gem, I just love it. Yes your right its too good for my brother, Its my Precious, to quote a well known Character. Get one and see if you can give it up, then judge me!